David Bowie releases are coming fast and furious. Last month Parlophone announced the release of Spying Through A Keyhole, a 7" box set which collects nine rare and previously unreleased demos. Now Parlophone has announced a completely separate 7" vinyl singles box (release date TBA) featuring six home demos, four of which are previously unreleased recordings. 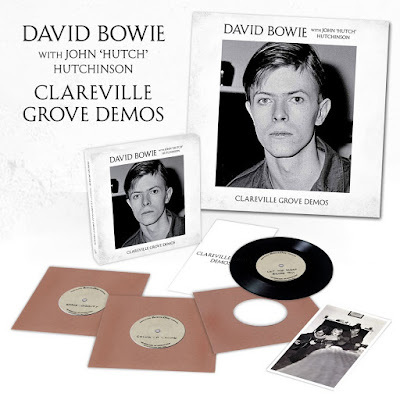 The recordings, known as the Clareville Grove Demos, were recorded live to tape at Bowie's flat in London in 1969 and feature Bowie and John ‘Hutch’ Hutchinson on guitar and vocals. The boxset features three 7" singles; each 7" contains two demos. Note: The demos are all mono recordings. View the tracklisting for Clareville Grove Demos below and read more about the release here. The previously announced boxset Spying Through A Keyhole will be released on April 3rd and is available to pre-order here. Meanwhile the Pin Ups picture disc that was announced earlier this week will be released April 13th for Record Store Day.